Clay Cloth, 12"x12" » Dr Detail | It's about time you saw the dr! Clay Cloth, 12"x12"
Selection » Paint Care » Wash & Clay Bar » "Clay" Cloth, 12"x12"
Now you can get a truly clean surface before you glaze and wax without resorting to abrasives. If you're familiar with a clay bar then hold on because it's successor has arrived. Always wash your car first before using any "Clay" product. Meguiars M62, Professional Car Wash Shampoo, 3D Pink Soap (pure shampoos) or Meguiar's D11101 Shampoo Plus, 3D Wash N Wax (shampoos plus "Glossifiers") are all excellent choices. However, when you wash your paint you only remove water soluble materials. What about the road tar, grease, tree sap, rail dust, hard water deposits, etc. which soapy water can't dissolve and remove? That's what a clay bar is all about. It will remove all the non-water soluble paint contaminants. Safe to use on all paint, glass, chrome, plastic, etc. This new product is a 12"x12" microfiber cloth coated on one side with a revolutionary new rubberized polymer which will do the job of the clay bar - better - and with less FUSS! Kneading the clay bar into a fresh, cleaner surface is a thing of the past. Drop it and throw it away? ... NOT with the new products! Just rinse them off thoroughly and go back to work. Compared to the finger tip working patch for clay you get to use your whole hand to do the job. If you get 12 to 15 cars per 200 gram bar then you're being very efficient BUT the new products are capable of 50 cars, as advertised, and possibly 80 to 100! Now you noticed I mentioned "Products". There is more than one. You can choose between the 12"x12" cloth, here, or select the "Clay" Mitt or one of the "Clay" Pads for DA or Cyclo (that is to say, in 6" or 4"). Enter, stage left, a very-neglected, black Suburban (you know, the original UV [not SUV] by Chevy). This vehicle was covered in several colors of oversprayed paint. I whipped out the old clay bar and started removing the problem. The bar did a good job, but not in a reasonable period of time. It was taking much too long. I grabed the "Clay" cloth and - BOOM - a few passes and the area was clean. Save time, do a better job, save money and enjoy life with the latest Tech. About that money thing ... up front cost is much higher but, do the Math, 12 to 15 cars vs 50 to 80 cars for 2-3 times the cost. You have to need the volume but if you do, you gotta' have this stuff. A lubricant, like Meguiars M34, Final Inspection or any other mist & wipe, is still necessary as with any clay bar. The lubricant will cause the cloth to "hydroplane" over the surface and protect the paint from contact but will still allow the contaminants to be reached. The method recommended to remove any contaminant with "clay" is simple and similar. 1. Spray the rubberized polymer surface with lubricant. 2. 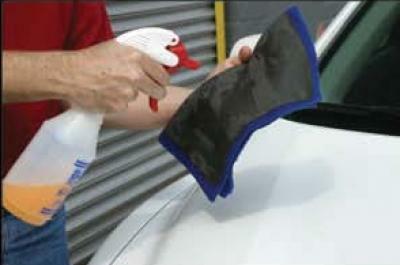 Use a water-based lubricant to help the "clay" glide over the paint surface. All the “Mist & Wipe” products are ideal. The doctor recommends Meguiars M34, Final Inspection. Spray the lubricant with a trigger sprayer over the area to be cleaned. 3. No “Knead” is necessary. Lightly rub the lubricated area with much the same motion as when washing. Rubbing should not be hard, the "clay" works with minimal pressure. 4. Once the "clay" gets loaded up with contaminants, simply rinse it off with lubricant and go back to work. 5. Secure the clay after use in a clean container like a baggie but protect the rubberize polymer surface from contact with itself. In hot environment it can stick. If it sticks peel the two surfcaes apart gently applying only enough force to encourage the surfaces to release. If you tear or patch a section it can safely be ignored.